You are viewing a museum quality fine-art print. Beautiful custom framed with Plexiglass. Each frame is individually made by our professional expert framers right here in the United States. Our workmanship is of the highest quality. The prints we carry are produced using either the lithographic or serigraphic printing process and are printed on high quality archival acid free paper. Each print is of the highest museum art print reproduction quality and are supplied by the world's leading art publishers and artists. These prints rival any detailed reproduction from their originals and are geared towards the discerning eye of the particular art collector. This print is perfect for any elegant home, office, restaurant or place of business. 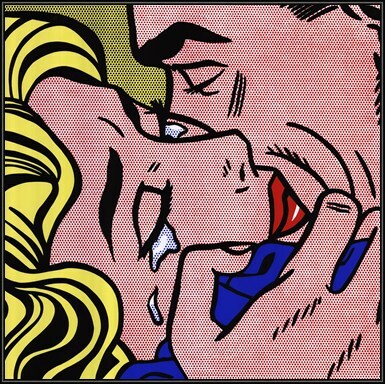 Click the button below to add the Kiss V (serigraph) - Roy Lichtenstein to your wish list.